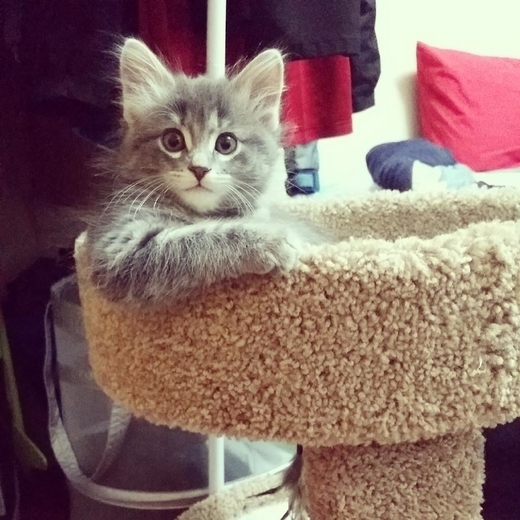 What is the Best Cat Tree? When cat’s retire and move to Florida they typically look to purchase a condominium...sorry, just kidding...actually a cat condo is like an amusement park for cats. Also known as a cat tree, they are composed of many levels, these condos have unique features that seek to keep cats entertained. 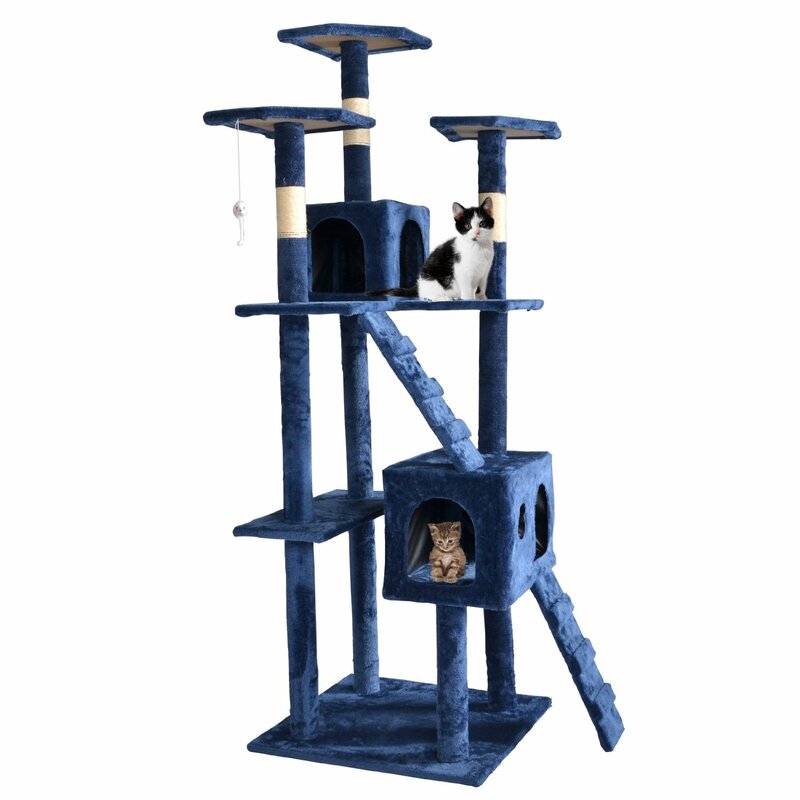 Towering up to over 80 inches tall in some cases the best cat tree can have built in hammocks, tunnels, ladders, platforms, a large scratching post, and toys attached to their frames. Some are as simple as a base, a pole and a platform and others have so many different levels and spread out horizontally that they can accommodate several cats at once. These condos encourage a cat’s natural behavior to climb, scratch, rub, and burrow and are quite stimulating. 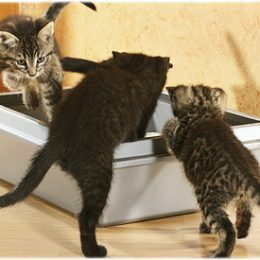 They mimic the outside world and can be a great joy for indoor cats providing hours of fun. And even better, they keep your cat from destroying your furniture. 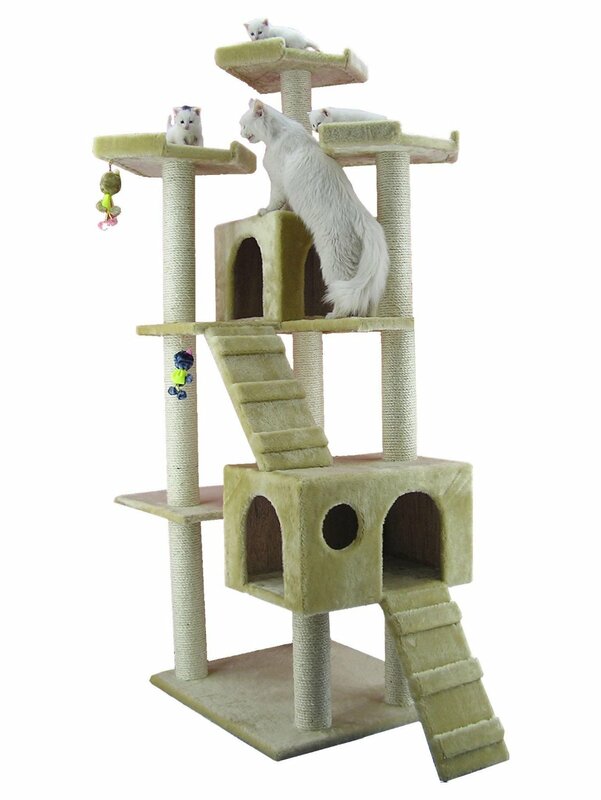 A cat climbing tower also benefit cats as they provide a safe haven for escape. This cat furniture becomes a cats’ private space and a comfort to retreat to in times of stress or danger. Cats feel especially safe up high and out of reach and some of the taller quality cat trees provide protection to a threatened cat. All in all, cat condos are a little like a 2nd home in your house. They provide your cat with spaces to nap, scratch, play, and to hide. And they come in all shapes, sizes, colors and materials so they fit into any space in your home and can match any décor. What Goes In To Making A Great Cat Tree? Tunnels, Posts, and Toys! Oh My! But first, here's a dose of kitty cuteness in CAT TREE BATTLE! Several different materials are used to make a cat playhouse. From PVC pipes to true tree trunks, there are a myriad of ways to build a cat tree. 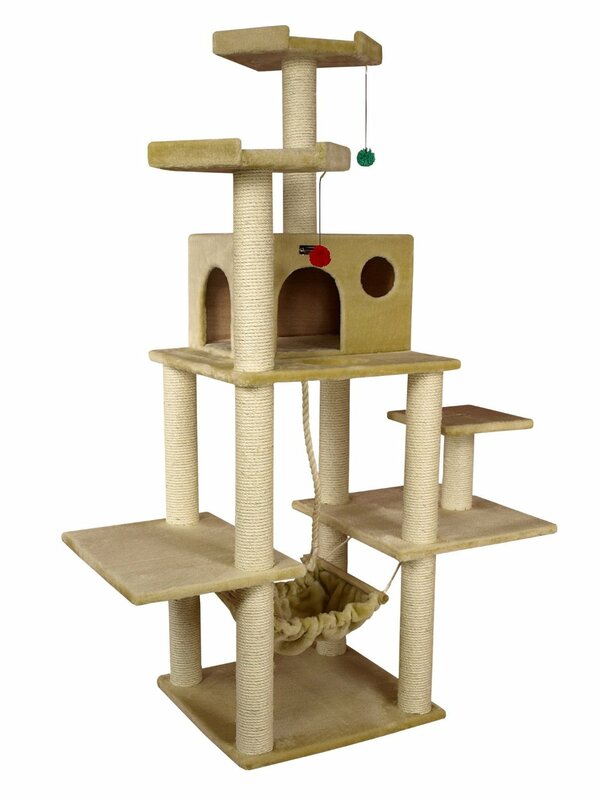 Most of the cat trees for sale have a frame made of thick cardboard and pressed wood. The thick cardboard makes up the posts and short tunnels in the cat tree. The flat baseboard and platforms are made up of pressed wood. 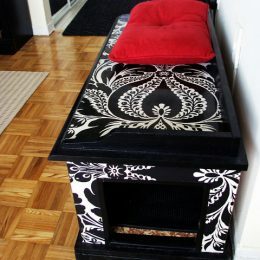 Short pile carpet or faux fur will cover the frame. Short pile carpet is not seen as often in cat trees as the loops in the carpet can ensnare a cat’s claws. Faux fur is softer and less likely to be an issue. It is the material more commonly seen on cat condos. There are several different colors to choose from but the most common colors are white, brown, beige and grey. The top cat scratching posts are made up of a rough rope like substance called sisal. This material is also used in cool cat trees. Typically it is wound around the posts of the cat tree in several different places. 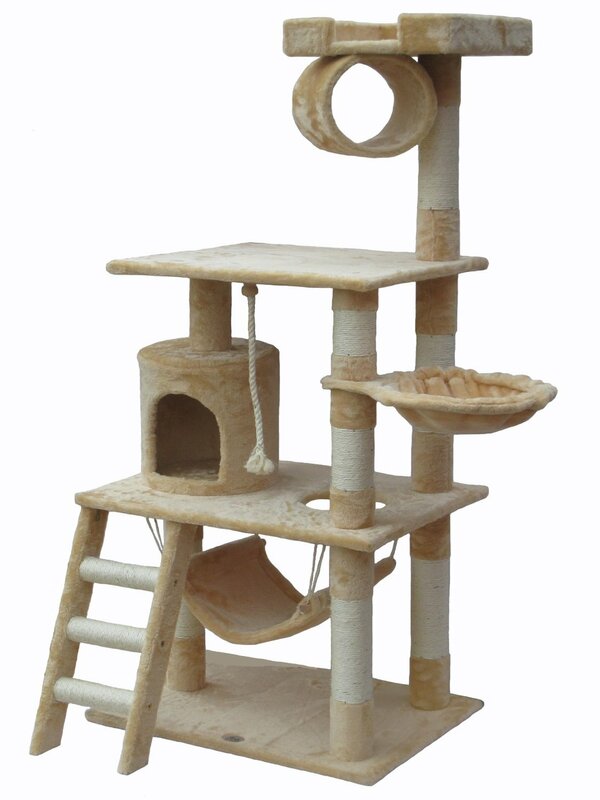 There should be a sisal section close to the ground and near platforms on the cat condo for easy reach. Not only is it used for scratching but spacing the sisal throughout the posts on the tree allows for good traction to grab and climb the posts as well. Less common materials include real wood, tree limbs, plastic and nylon. Real wood, while more solid and durable, can be quite heavy resulting in a cat tree that can weigh up to 200 lbs or more. It is also more expensive. While it is “cute” to have a real tree in your home for your cat, the trees can come with bugs or parasites embedded in the wood. In addition if you have a cat that really likes to scratch the wood can be destroyed fairly quickly. While far stronger than thick cardboard, plastic posts and tunnels are difficult for cats to grip onto. They are also hard to cover with faux fur, sisal or carpet as the glue does not adhere as effectively as it does to the cardboard. Most cat trees shipped to the consumer are in pieces. 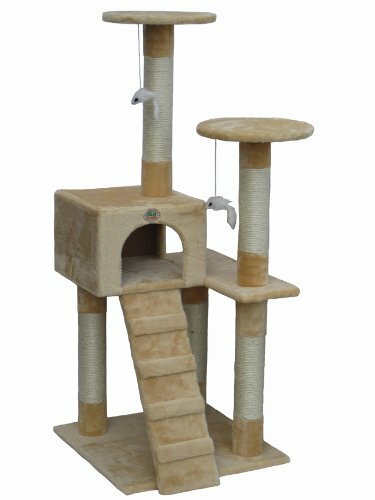 The best cat tree should come with a detailed set of instructions containing a support phone number or email to contact with questions. In addition screws are more desirable than nails or glue as they hold the tree together quite securely and are less likely to pull apart under stress. Cat trees come in a variety of shapes and sizes. Some can get as tall as 8 feet and fit snugly against your ceiling. Or, they can fit just under a window for the perfect sunning and bird watching perch. Others can be as narrow as a telephone pole to fit in a small space. Still there are other cat condos that can spread out 5 or 6 feet across. 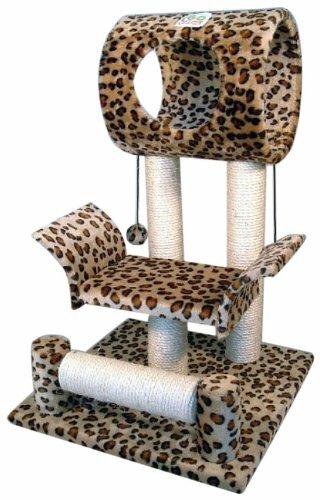 Some have lots of spaces for entertainment and others may just have a simple platform or two for some R & R.
Before you begin shopping for a cat tree it is a good idea to know where in your home you wish to place it. Measure the width, depth and height of this area so you have your dimensions when you start to shop. 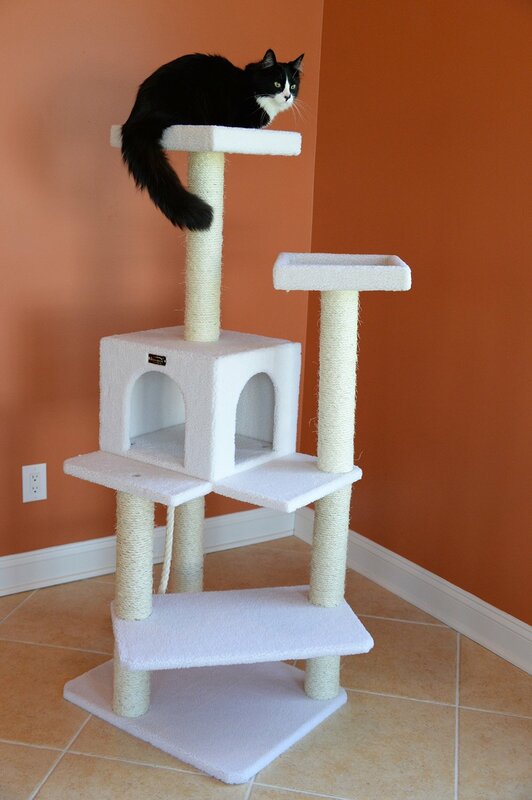 The height of some cat trees can be adjusted to your ceiling height so take that into consideration. Pay attention to your décor. 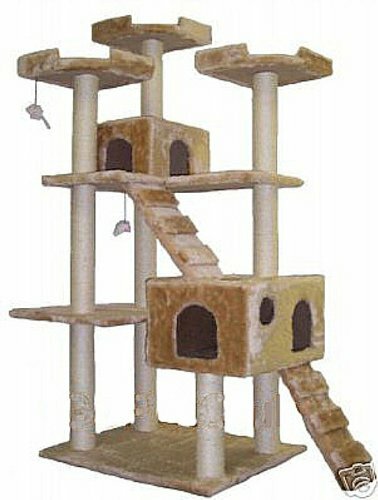 Many cat condos will come in various colors to suit your needs. If color does not work for you keep shopping. You may find a similar cat tree in the correct color. Also keep in mind that cats like to be with their people. So even the best cat tree placed in an unused room may never get used by your cat. 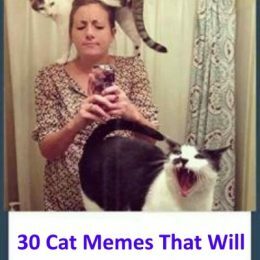 Also consider the type of cat you have. Is it a standard 5 lb domestic short hair or a 30 lb Savannah? A smaller cat can be just fine with a smaller tree. 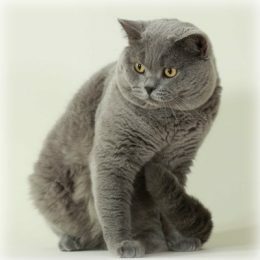 Whereas a large feline will need a taller and wider condo to satisfy their needs. Is your cat very active or a couch potato? An active act would do well with a larger tree with more entertainment features such as multiple scratching posts, dangling toys and several platforms to jump on. 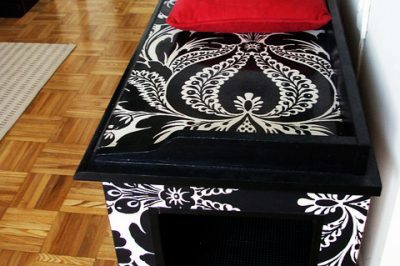 For the couch potato all you may need are a few platforms and a comfy covered bed. 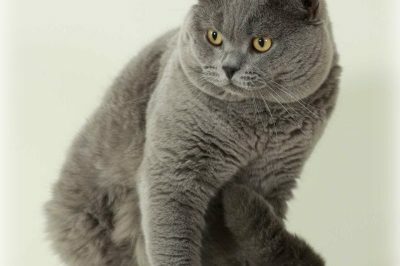 But, if your couch potato could stand to lose a few pounds then a cat condo with additional features like toys and different levels might be purrrfect to shed the weight. The number of cats also has direct bearing on the cat playhouse you need to purchase. Obviously the more cats you have, the bigger the condo. Each cat should have a resting space just for them. So you want to make sure you have enough platforms, beds and hammocks to accommodate your kitty herd. 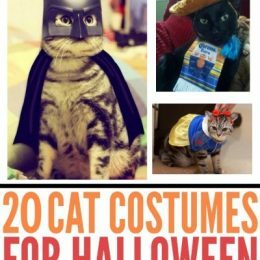 In addition, in the multiple cat household it is important to take into consideration your cats different personalities. Some cats may be territorial and choose not to share their kitty condo. In this case smaller trees spread throughout the home might work better than one big one. Finally consider your budget. Cat condos can range in price from $50.00 all the way up to several thousand. Keep in mind the cheaper cat condos may not be as well made or sturdy and you may find yourself replacing them in a few years. Also if you want to try to make your own condo, determine the cost first. It may actually be cheaper to purchase a cat tree as the manufacturers can buy their supplies at wholesale prices and in bulk. Making a checklist of your needs will make the purchase much easier. Most shopping sites allow you to narrow down your selection based on those needs. 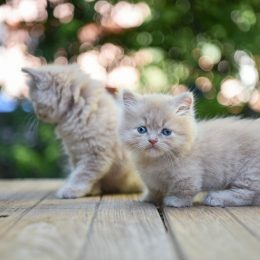 Make full use of this option as there are hundreds of cat condos out there and finding the right one for your cat can get overwhelming. 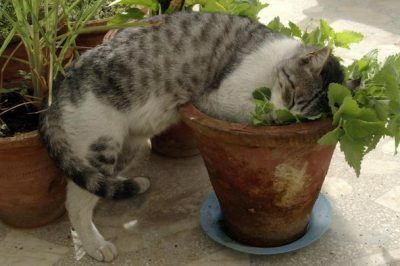 Cats are very active creatures. Cat condos are built with this in mind and offer many options to satisfy a cat’s natural instincts to climb, scratch, hide, jump and sleep. 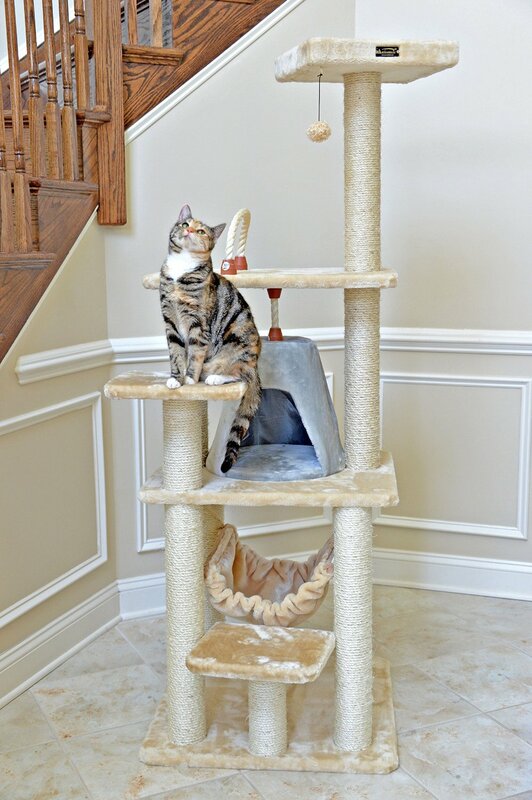 Most cat trees have common features that service to satisfy a cat’s natural behavioral tendencies. 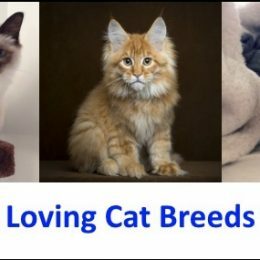 Some however come with atypical features that may serve to benefit your cat’s innate requirements. 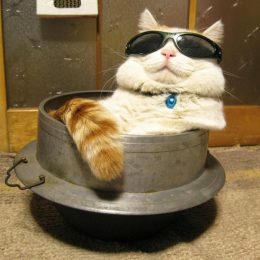 Through observation of your cat’s behavior you will know what accessories may or may not benefit your cat. Tunnels- What cat does not like to dive into a bag or box left sitting on the floor. Cat’s love to be inside den-like spaces. Cat trees typically have cylindrical tunnels for them to crawl through. 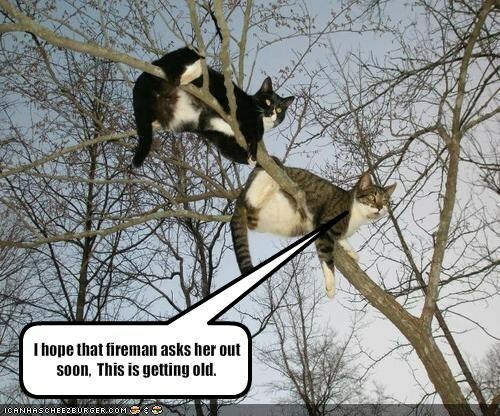 Scratching Posts- All cat owners have seen the results of a cat without a scratching post. Furniture ruined and walls and wall trim shredded beyond repair. Cat condos usually have several areas on the cat tree posts covered in sisal to assuage this destructive tendency. For those who have cats that are heavy scratchers some cat condos actually come with additional scratching pads. Toys –Many of the more elaborate cat condos come with toys hanging down from one of the platform’s or tunnels. These toys are easily accessible by the cat for batting, tackling and chewing. Be aware that many of these toys will quickly break away if you have cats that are very aggressive players. Perches/Platforms- Cat’s love to be up high. All cat condos have some form of platform at the top of the tree to satisfy a cat’s urge to oversee the goings on around him. Take note that a platform down low to the ground will probably not be used as a perch but rather as a stepping stone to higher levels. 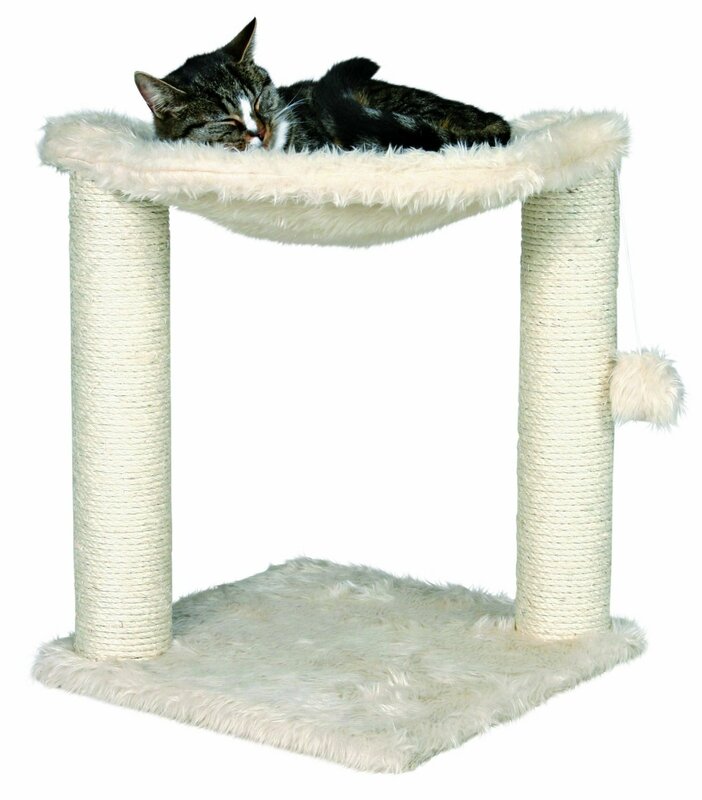 Bedrooms – When shopping for a cat tree with a bedroom be sure to select one with a bedroom near the top of the cat tree. Typically cats do not like to sleep in these bedrooms if low to the ground as they do not have another means of escape besides the front opening. Up high they feel safe and are willing to curl up for a nap. Hammocks- Many of your more elaborate cat trees have hammocks for your cat to nap. These will probably be in addition to closed in bed rooms. The hammocks work best for cats who like to watch what is going on around them or are skittish about sleeping in the closed in bedrooms. Ramps/ladders –Ramps and ladders are usually available on the busier and large cat trees. These are perfect for cats that are very active as cats can access them at a very fast pace. Often the ladders will come with sisal rungs for scratching. Cat condos are a great addition to any feline household. They provide a source of entertainment for young or active cats and a place to rest and watch the world go by for our senior felines. In addition they keep indoor cats from getting bored and serve to mimic the obstacles a cat would find outdoors. They also keep destructive tendencies away from furniture and focus these behaviors on the cat tree. They are also a perfect gym for the cat that may need to lose a few pounds. 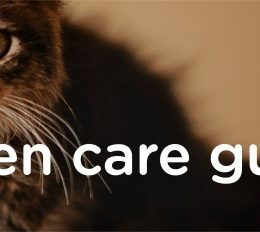 When purchasing a cat tree make a check list of your cat’s needs, the dimensions of the home space, the features you are looking for and the color of the condo. Keep this handy when shopping for your tree. Once your cat tree arrives make sure all the parts are there. When assembling you tree loosely screw it all together first to ensure it is complete. Finally tighten all the screws as much as possible, place the cat condo in its appointed spot. Do not be surprised if it takes a few days for your cat to warm up to this new and strange contraption. But once they acclimate just sit back and watch the fun!